Let me say a few words about how the configs are organized. I will begin with the colors in my .Xdefaults file. As you might have observed, I have different color setups for Xterm, URxvt and Rxvt. I call the XTerm color, Xtrail and is derived from vermaden’s config. Here is a shot of the color profile. Rxvt colors follow a different palette and I call it a Technicolor Variant. You can see the color profile in the following shot. I have three color configs for URxvt. I am currently using something called Technobass. The colors look like the one in this shot. I also have two Technicolor variants in there as well. The following couple of screens should give you an idea. 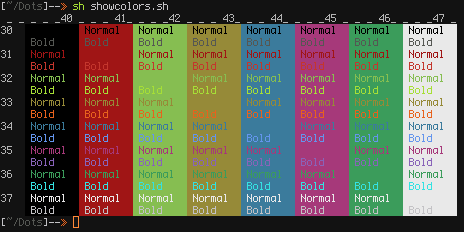 Technicolor I is nothing more than the famous Gentoo color setup. Technicolor II is a marriage between some of my own colors and sirmacik and gigamo’s colors. Terminus is used globally across all three terms. And as I had mentioned earlier, it is a patched version that uses alternate characters for some letters. I will upload the same in my next post. Anyway, this completes the color definition. You can access my configs here. Since there were a few requests for the theme in action on ChromaX xfce4 screenshot a few posts earlier, I am posting the theme. The original royalty theme was created by the one and only thrynk aka lyrae. Too bad she isn’t active anymore. Royalty is one of my all time favorite gtk themes. It uses just xfce and mist engines and is pretty fast. sen7 from devart was the one who modded this theme. I just changed a couple of things here and there. So, credits should go to thrynk and sen7. Just click on the image to download the archive. It includes both gtk and xfwm4 themes. I had posted the Individual Eleven wallpaper a few posts earlier as well. OpenBSD 4.8 has been absolutely brilliant on my EEE1000H. I have tested so many operating systems on my EEE, that I have lost track of just how many. Once, I was able to build a pretty mean, kickass version of LFS on this device, which followed the grimoire model of Sorcerer for package management. But as I had briefly mentioned earlier, migrated to BSD on this machine as well. After cycling through various BSD’s, I have settled down on OpenBSD. In fact, OpenBSD had support for the wireless card on this machine long before many operating systems. I remember using ndisgen to use wireless on FreeBSD then. It was terrible. But no such problems with OpenBSD. I am sure FreeBSD has a driver for the machine now. Besides, nothing beats OpenBSD’s wireless management. It is so damn simple and I doff my hat to all the masturbating monkeys behind it, especially the lead masturbator, Damien Bergamini. Since this is the machine that I carry with me on travel, a stable no nonsense, secure and functional platform is the prime directive – to take a leaf out of Starfleet’s General Order 1. We all know what OpenBSD’s stance on security and stability is. Hence, it was easy for me to make the choice. Coming to the aesthetic side of things, I alternate between ScrotWM and cwm. cwm is part of Xenocara (OpenBSD’s kickass build infrastructure of X.Org), which is what I use most of the time. ScrotWM takes care of tiling needs. I will talk about cwm in a separate post later. For the time being, I am posting my EEE screenshot, with cwm in action. As usual, click on the image for full view. I have resurrected my sticker conky from a few posts back. Other things on display are, some ascii art, a piece of code and the audio player interface, vitunes. Like cwm and ScrotWM, vitunes was also originally developed for OpenBSD. It has been ported to FreeBSD and it is easy to build on Linux as well. Basically, it is a frontend for mplayer and the keybindings work like in vi editor. It was developed by logician Ryan Flannery. I will push my sticker conky to my github account as well. Please give me a couple of days. Wallpaper is the carbon fiber tile-v2 from subtlepatterns. The terminal font is called Dweep, and it is based on Jim Knoble’s Neep font. cwm menu and conky font is Standard 07_57 Caps, which I posted along with my Bridge fluxbox theme earlier. I will release Dweep in a few days. I am posting the fluxbox theme on display in the previous post right here. I named it Bridge, for obvious reasons. I have also included the Standard Caps font in the archive. Just move the font to your local font folder and update your font cache. If you don’t like the font, edit the font definition in the config file, theme.cfg to use your own font. If you use an overlay file globally, then simply comment out the font entry. Click on the image to download the archive from omploader. Star Trek means more than just a series to me. You might have heard this from so many people and it holds true in my case as well. I took a special interest in Engineering and Theoretical Physics because of the original series. That’s why I studied both. I had lost track of it for quite a while, but took it up again a few months ago. When my ex dumped me, it was really tough. I had to find my grip again and hence, Star Trek came into prominence. This might sound silly, but it totally works in my case. Anyway, I will expand a bit on this theme later. Since September 8th, I have been using the following setup on my desktop. 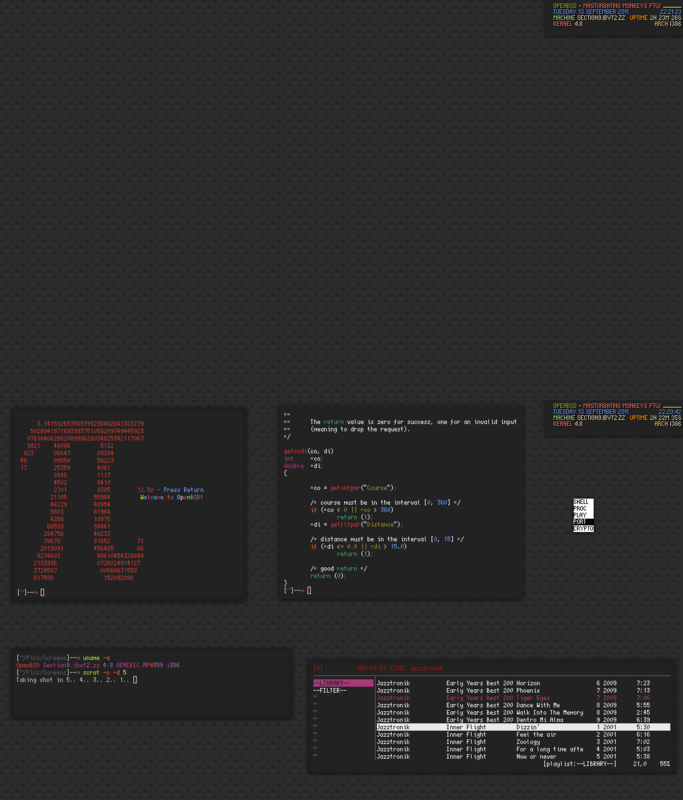 Window manager is Fluxbox and the theme is a slightly modified version of my Color Me Bad theme. The primary colors of this theme are derived from Star Trek Original Series uniform colors, namely, blue, khaki and red. They might not be that accurate of course. Without further ado, here is the screenshot. Click on the image for full view. 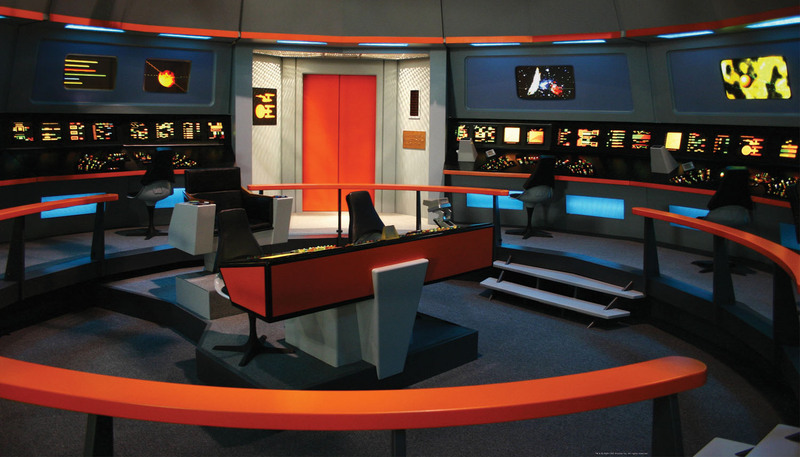 The Enterprise bridge backdrop comes from wall 2 wall stickers. I am posting the image here as well. The ascii art come from Star Trek Ascii Art website. There are some amazing stuff over there. Please check them out. Modified my Xdefaults a bit, but still pointing towards the Technicolor palette. Also, did away with my previous zsh prompt and chose a simple rone. 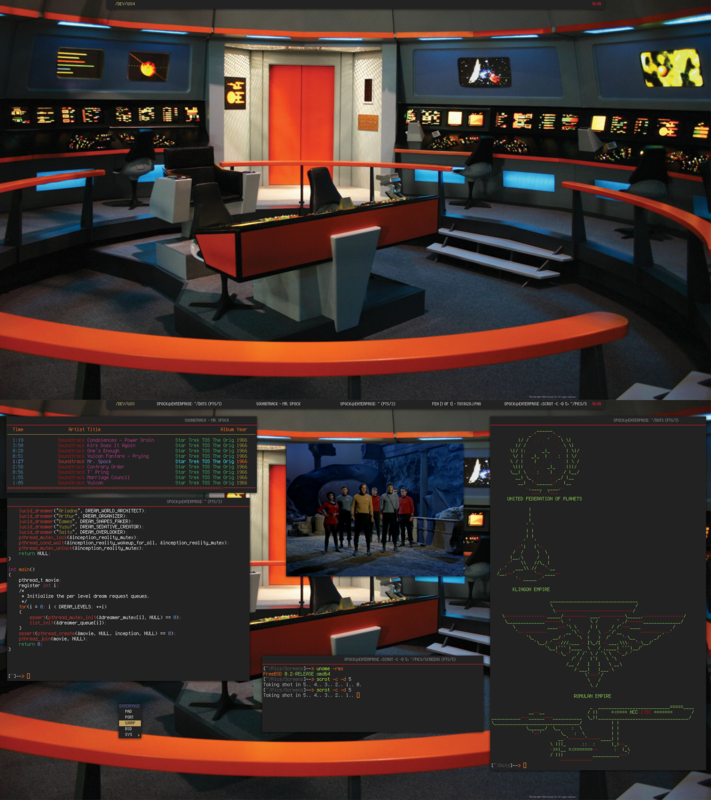 The fonts are Terminus (with multiple character patches) and Standard 07_57 Caps for the user interface. If anyone is interested in the fluxbox theme, just drop a note using the comment feature. Click on the wallpaper for full size. Yes, I do have a GitHub account where all my config files are hosted. But they are very old and haven’t been updated for a long time. I will push all my configs and code this coming weekend. They require some massive cleanup to get rid of my machine specific stuff that wouldn’t be useful to anyone but me. I will post a message here once it is updated of course. As I have had some requests to release my thayer inspired fluxbox theme, I have done so. The theme is called Semblance and is available at box-look for download. The wallpaper is also linked on box-look. Feel free to give it a test run. Click on the image to go to box-look.